Spitz nevus is named after Dr. Sophie Spitz, who in 1948 reported a case series of "melanomas of childhood." [1, 2] Nearly all of Spitz’s original series of 13 cases are now regarded as representing Spitz nevi, only 1 case having proved to be a melanoma resulting in metastasis and death. Spitz nevus may still be regarded as a clinically and histologically distinct variant of melanocytic nevus composed of spindled and/or epithelioid melanocytes (in the configuration of a benign tumor). Synonyms include Spitz’s nevus, Spitz tumor, and spindle and epithelioid cell nevus. The spectrum of Spitz nevi includes junctional, compound (most common), and intradermal variants. Most desmoplastic Spitz nevi are intradermal or predominantly intradermal. Pigmented spindle cell nevus (Reed nevus) is regarded by most authorities as a clinically and histologically distinct variant of Spitz nevus. Many other clinical and histologic variants have been described. See Spitz Nevus and Melanocytic Nevi for more information. Spitz nevus usually represents a solitary, acquired nevus. Rare congenital Spitz nevi have been documented. The pathogenesis of Spitz nevi, like that of melanocytic nevi in general, has not been fully elucidated. However, there is evidence that cell proliferation in Spitz nevi, as in other types of nevi and in melanoma, is primarily mediated by activating mutations affecting genes in the RAS-RAF-MEK-ERK-MAP kinase pathway. Spitzoid nevi with epithelioid melanocytes and immunohistochemical loss of BAP1 expression (so-called BAPoma or Wiesner nevus) define a distinct form of tumor that in some cases may be associated with a heritable melanoma syndrome characterized by increased risk for ocular melanoma. [9, 10, 11] However, patients diagnosed with this tumor many not manifest other clinical features of the syndrome. Spitz nevus most commonly arises on the skin of the head and neck or the extremities (more commonly on the lower extremities than on the upper). Involvement of the central face (eg, nose, cheek) is classic (see the image below). However, it is prudent generally to be skeptical about a diagnosis of Spitz nevi on skin with severe solar elastosis or in elderly individuals. Spitz nevus, compound type. Classic location on the cheek of a child. A self-limited period of rapid growth over weeks to months, followed by stability in size, is often noted; however, pigmentary changes may continue to occur over time. Halo, congenital, hyperpigmented, agminated (grouped) or disseminated Spitz nevi represent uncommon clinical variants (see the image below). Halo Spitz nevus (biopsy confirmed). 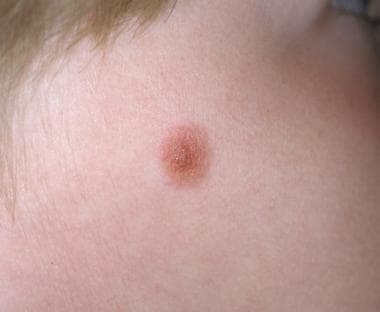 Dermoscopic (dermatoscopic) evaluation may reveal distinctive features of the nevi. 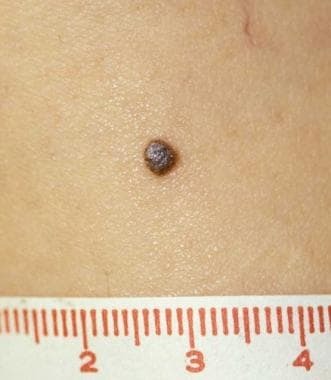 Pigmented spindle cell nevus (Reed nevus) is a uniformly heavily pigmented (dark brown-black), well-defined, round macule or minimally elevated papule, usually less than 6 mm in diameter (see the image below). Involvement of the proximal extremity of a woman is classic. Head and neck involvement is very unusual and should raise concerns about possible melanoma,  especially in adults. Pigmented spindle cell nevus (Reed nevus) on the thigh of a woman. 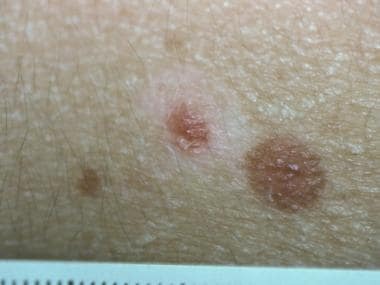 Because this lesion is a variant of melanocytic nevus, there is no staging classification for a correctly diagnosed Spitz nevus. Gross inspection of a formalin-fixed specimen containing a Spitz nevus parallels its clinical and dermoscopic appearance and does not yield diagnostically conclusive information. The recognition of atypical Spitz tumors (AST) reflects the fact that some melanocytic proliferations exhibit microscopic features (and biologic behavior) intermediate between classic Spitz nevus and melanoma. Historically, the original series of AST was designated "malignant Spitz nevus,"  reflecting the fact that AST are frequently associated with regional lymph node involvement—usually without widespread metastasis or death after a reasonable follow-up period. [23, 21, 22] Comprehensive discussion of AST is beyond the scope of this article. Practically speaking, its recognition and acceptance highlights the long-standing challenge in the interpretation of spitzoid melanocytic neoplasms as one of the most difficult areas in all of dermatopathology. Diagnoses should be rendered by experienced dermatopathologists with additional consultation and ancillary diagnostic testing in difficult cases in order to avoid overcalls and undercalls. Each "atypical" case must be judged on its own attributes, in the context of the degree of diagnostic confidence and competence. By definition, Spitz nevi are composed of spindled and/or epithelioid melanocytes; the proportion of spindled versus epithelioid cells varies from case to case. The melanocytes in Spitz nevi are generally larger than those in other forms of nevi. Cytologic details of the melanocytes may also vary somewhat, but the melanocytes of Spitz nevi generally display uniform features within each tumor. The melanocyte/nevocyte nuclei are generally round, vesicular, and centrally situated. 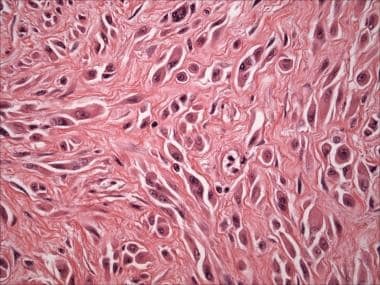 Although a minority or markedly enlarged or pleomorphic cells may be seen, nuclear pleomorphism, chromasia, and nucleolation are fairly uniform through the tumor, with evidence of maturation (detailed below). Cytoplasm is abundant, eosinophilic or amphophilic, and often two-toned. Multinucleation may occur, nuclear pseudoinclusions may be prominent, and the nucleoli may be enlarged and eosinophilic. However, eosinophilic nucleoli represent a common feature of Spitz nevus and melanoma. Cytoplasm is abundant and ranges from eosinophilic (most common) to slightly basophilic. Evidence of dermal zonation/maturation: A gradual transition from predominantly larger nests of melanocytes in the superficial dermal component to smaller melanocytes disposed within smaller nests, dispersed aggregates (often including single file strands), and single units within the deep dermal component, often aggregating within and around adnexal structures (hair follicles, sweat ducts; also blood vessels, nerve fibers, arrector pili). Spitz nevus, compound type (hematoxylin-eosin stain). 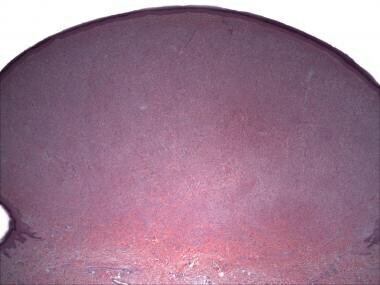 Symmetrical, circumscribed, dome-shaped, flat-bottomed profile at scanning magnification. Junctional or compound Spitz nevi exhibit distinctive epidermal changes, including epidermal hyperplasia. The junctional nests are typically vertically oriented, as are the spindled melanocytes within them, which resemble banana clusters (see the image below). Retraction artifacts or clefts typically surround the junctional nests. Spitz nevus, compound type (hematoxylin-eosin stain). Epidermal hyperplasia with vertically oriented spindle cells within vertically oriented junctional nests ("banana clusters"). Clefting/retraction around junctional nests. Pale eosinophilic globules known as Kamino bodies (after Dr. Hideko Kamino, the lead author of the group that first described them  ) are usually present at the basement membrane zone (dermal-epidermal junction) of Spitz nevi (see the images below). Kamino bodies contain periodic acid-Schiff/periodic acid-Schiff, digested stain (PAS/PASD)-positive basement membrane constituents, including laminin and type IV collagen. Spitz nevus (hematoxylin-eosin stain). Vertically oriented spindled junctional melanocytes and Kamino body. Spitz nevus (hematoxylin-eosin stain). Spindled melanocytes and coalescent Kamino bodies. Kamino bodies are specific for Spitz nevi but may rarely be seen in melanomas. When present in Spitz nevi, Kamino bodies are classically large, coalescent, and numerous. When present in melanomas, Kamino bodies are usually small and few in number and are often PAS negative; such characteristics suggest that these structures actually represent apoptotic cells. Spitz nevus, intradermal/desmoplastic type (hematoxylin-eosin stain). High-domed, symmetrical, flat-bottomed profile at scanning magnification. This nevus may be further classified as polypoid. Spitz nevus, intradermal/desmoplastic type (hematoxylin-eosin stain). Spindled and epithelioid melanocytes with prominent eosinophilic nucleoli, associated with fibrotic/desmoplastic stroma. Other histologic variants include polypoid, plexiform, angiomatoid, hyperpigmented, combined, halo Spitz nevus, and recurrent Spitz nevus. 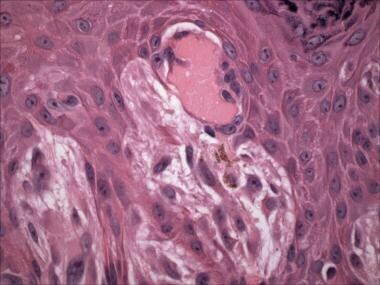 Pigmented spindle cell nevus (Reed nevus) is either a junctional or a superficial compound proliferation. By definition, the melanocytes are predominantly or exclusively spindled and pigmented (see the image below). The lymphohistiocytic host response contains numerous heavily pigmented melanophages. Pigmented spindle cell nevus (Reed nevus). Vertically oriented pigmented spindled melanocytes along the junction. Melanophages in the papillary dermis. Small numbers of large marked, severe, or strikingly atypical epithelioid melanocytes may be seen. The nuclei of these cells are more often vesicular than hyperchromatic (see the image below). Spitz nevus, compound type. This tumor from the arm of a 4-year-old contains a dense epithelioid melanocytic proliferation with features that overlap with those of melanoma: scattered markedly atypical epithelioid melanocytes. 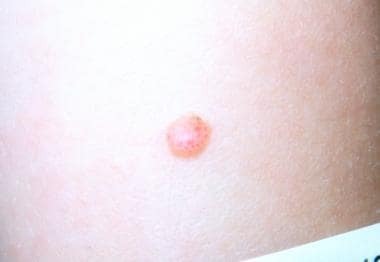 The degree of pagetoid growth of single melanocytes in Reed nevus, particularly in children, may be greater than that seen in some examples of melanoma in situ (see the image below). Spitz nevus, compound type. This tumor from the arm of a 4-year-old contains a dense epithelioid melanocytic proliferation with features that overlap with those of melanoma: pagetoid growth and transepidermal elimination of melanocytic nests resembling so-called consumption of the epidermis. Mitotic figures within junctional or dermal melanocytes are often present (see the image below). 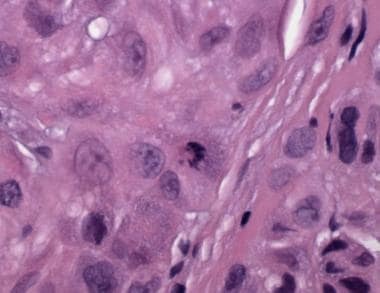 The rules for assessing mitoses are the same as for all melanocytic tumors. That is, mitotic figures in nevi are generally rare in number, not clustered, not atypical in appearance, and confined to the dermal epidermal junction and superficial dermal component. 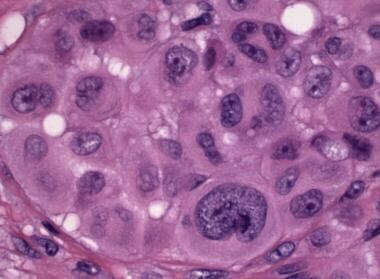 Conversely, high numbers or "hot spots" of mitoses, atypical forms, deep mitoses, or suprabasilar mitoses suggest melanoma. Spitz nevus, compound type. This tumor from the arm of a 4-year-old contains a dense epithelioid melanocytic proliferation with features that overlap with those of melanoma: many dermal mitoses. However, because Spitz nevi often exhibit a rapid growth phase, the presence of numerous typical mitoses within the superficial dermal component of an otherwise classic Spitz nevus does not specifically suggest melanoma. Because Spitz nevi usually arise in children and young adults, solar elastosis is usually absent. 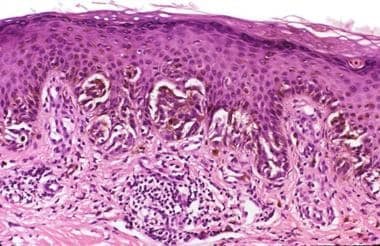 Thus, spitzoid proliferations, especially pure spindle cell or pure epithelioid cell melanocytic proliferations on skin with severe solar elastosis usually represent melanoma. In cases in which the tumor cell lineage is uncertain on hematoxylin-eosin (H&E) staining, melanocytic markers may be used to stain Spitz nevi. The most sensitive marker is polyclonal S100. Other melanocytic markers include SOX-10, Melan-A (MART-1), HMB-45, MiTF, tyrosinase, and NKI/C3. Loss of BAP-1 and kinase fusions can be identified using immunohistochemistry (BRAF, ALK); however, these alone are not diagnostically specific. Missed melanoma represents a leading cause of medical malpractice cases; many of these are initially misdiagnosed as Spitz nevi. (See Microscopic Findings and Immmunohistochemistry above). Melanoma is curable if caught early, but it is consistently fatal if left untreated. Moreover, melanoma disproportionately affects younger individuals compared to the more common non-melanoma skin cancers. Regional lymph node involvement by atypical spitzoid tumors has been increasingly documented, many in children. [42, 23] Despite the presence of metastatic disease, in many of these cases, the follow-up to date has been more favorable than would be expected in comparison with conventional melanomas of similar tumor burden. Thus, although each case must be evaluated individually and comprehensively, clinical experience suggests that there is a differential diagnosis for regional lymphatic involvement by melanocytes that includes spitzoid melanoma (possibly divisible into prognostically distinct subsets—for example, spitzoid melanoma of childhood),  other forms of melanoma, AST, [3, 22] and various forms of nodal nevi. Whenever feasible, obtaining one or more additional opinions on the pathologic diagnosis and following an interdisciplinary management approach are prudent in these problematic cases. SPITZ S. Melanomas of childhood. Am J Pathol. 1948 May. 24(3):591-609. [Medline]. [Full Text]. Ackerman AB, Elish D, Shami S. "Spitz’s Nevus": Reassessment Critical, Revision Radical. New York: Ardor Scribendi; 2007. 360. Harms KL, Lowe L, Fullen DR, Harms PW. Atypical Spitz Tumors: A Diagnostic Challenge. Arch Pathol Lab Med. 2015 Oct. 139 (10):1263-70. [Medline]. Massi G, LeBoit PE. Histological Diagnosis of Nevi and Melanoma. Germany: Springer-Verlag Berline Heidelberg; 2014. Bastian BC, LeBoit PE, Pinkel D. Mutations and copy number increase of HRAS in Spitz nevi with distinctive histopathological features. Am J Pathol. 2000 Sep. 157(3):967-72. [Medline]. [Full Text]. Maldonado JL, Timmerman L, Fridlyand J, Bastian BC. Mechanisms of cell-cycle arrest in Spitz nevi with constitutive activation of the MAP-kinase pathway. Am J Pathol. 2004. 164:1783-7. Da Forno PD, Pringle JH, Fletcher A, Bamford M, Su L, Potter L, et al. BRAF, NRAS and HRAS mutations in spitzoid tumours and their possible pathogenetic significance. Br J Dermatol. 2009 Aug. 161(2):364-72. [Medline]. Bender RP, McGinniss MJ, Esmay P, Velazquez EF, Reimann JD. Identification of HRAS mutations and absence of GNAQ or GNA11 mutations in deep penetrating nevi. Mod Pathol. 2013 Apr 19. [Medline]. Wiesner T, Murali R, Fried I, Cerroni L, Busam K, Kutzner H, et al. A distinct subset of atypical Spitz tumors is characterized by BRAF mutation and loss of BAP1 expression. Am J Surg Pathol. 2012 Jun. 36(6):818-30. [Medline]. [Full Text]. Wiesner T, Obenauf AC, Murali R, Fried I, Griewank KG, Ulz P, et al. Germline mutations in BAP1 predispose to melanocytic tumors. Nat Genet. 2011 Aug 28. 43(10):1018-21. [Medline]. [Full Text]. Piris A, Mihm MC Jr, Hoang MP. BAP1 and BRAFV600E expression in benign and malignant melanocytic proliferations. Hum Pathol. 2015 Feb. 46 (2):239-45. [Medline]. Wiesner T, He J, Yelensky R, Esteve-Puig R, Botton T, Yeh I, et al. Kinase fusions are frequent in Spitz tumours and spitzoid melanomas. Nat Commun. 2014. 5:3116. [Medline]. Yeh I, Botton T, Talevich E, Shain AH, Sparatta AJ, de la Fouchardiere A, et al. Activating MET kinase rearrangements in melanoma and Spitz tumours. Nat Commun. 2015 May 27. 6:7174. [Medline]. Barnhill RL, Piepkorn J, Busam KJ. Spitz nevus and variants. In: Barnhill RL, Piepkorn J, Busam KJ. 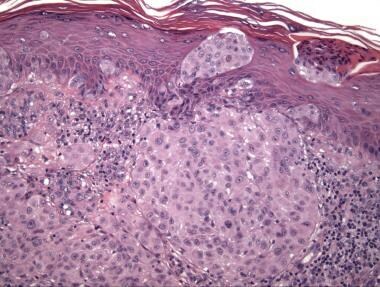 Pathology of Melanocytic Nevi and Malignant Melanoma. New York: Springer; 2004. 148-198. Lott JP, Wititsuwannakul J, Lee JJ, Ariyan S, Narayan D, Kluger HH, et al. Clinical characteristics associated with Spitz nevi and Spitzoid malignant melanomas: the Yale University Spitzoid Neoplasm Repository experience, 1991 to 2008. J Am Acad Dermatol. 2014 Dec. 71 (6):1077-82. [Medline]. Busam KJ, Kutzner H, Cerroni L, Wiesner T. Clinical and pathologic findings of Spitz nevi and atypical Spitz tumors with ALK fusions. Am J Surg Pathol. 2014 Jul. 38 (7):925-33. [Medline]. Yeh I, de la Fouchardiere A, Pissaloux D, Mully TW, Garrido MC, Vemula SS, et al. Clinical, histopathologic, and genomic features of Spitz tumors with ALK fusions. Am J Surg Pathol. 2015 May. 39 (5):581-91. [Medline]. Troxel DB. Pitfalls in the diagnosis of malignant melanoma: findings of a risk management panel study. Am J Surg Pathol. 2003 Sep. 27(9):1278-83. [Medline]. Massi D, Tomasini C, Senetta R, Paglierani M, Salvianti F, Errico ME, et al. Atypical Spitz tumors in patients younger than 18 years. J Am Acad Dermatol. 2015 Jan. 72 (1):37-46. [Medline]. Moscarella E, Lallas A, Kyrgidis A, Ferrara G, Longo C, Scalvenzi M, et al. Clinical and dermoscopic features of atypical Spitz tumors: A multicenter, retrospective, case-control study. J Am Acad Dermatol. 2015 Nov. 73 (5):777-84. [Medline]. Barnhill RL, Argenyi ZB, From L, Glass LF, Maize JC, Mihm MC Jr, et al. Atypical Spitz nevi/tumors: lack of consensus for diagnosis, discrimination from melanoma, and prediction of outcome. Hum Pathol. 1999 May. 30 (5):513-20. [Medline]. Ludgate MW, Fullen DR, Lee J, Lowe L, Bradford C, Geiger J, et al. The atypical Spitz tumor of uncertain biologic potential: a series of 67 patients from a single institution. Cancer. 2009 Feb 1. 115 (3):631-41. [Medline]. Tom WL, Hsu JW, Eichenfield LF, Friedlander SF. Pediatric "STUMP" lesions: evaluation and management of difficult atypical Spitzoid lesions in children. J Am Acad Dermatol. 2011 Mar. 64(3):559-72. [Medline]. Smith KJ, Barrett TL, Skelton HG 3rd, Lupton GP, Graham JH. Spindle cell and epithelioid cell nevi with atypia and metastasis (malignant Spitz nevus). Am J Surg Pathol. 1989 Nov. 13 (11):931-9. [Medline]. Massi G, LeBoit PE. Spitz nevus. In: Histological Diagnosis of Nevi and Melanoma. Germany: Steinkopff Verlag Darmstadt; 2004. 169-234. Kiuru M, Patel RM, Busam KJ. Desmoplastic melanocytic nevi with lymphocytic aggregates. J Cutan Pathol. 2012 Oct. 39 (10):940-4. [Medline]. Kamino H, Misheloff E, Ackerman AB, Flotte TJ, Greco MA. Eosinophilic globules in Spitz's nevi: New findings and a diagnostic sign. Am J Dermatopathol. 1979 Winter. 1(4):323-4. [Medline]. Harris GR, Shea CR, Horenstein MG, Reed JA, Burchette JL Jr, Prieto VG. 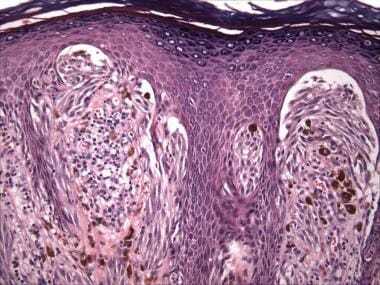 Desmoplastic (sclerotic) nevus: an underrecognized entity that resembles dermatofibroma and desmoplastic melanoma. Am J Surg Pathol. 1999 Jul. 23(7):786-94. [Medline]. Ferrara G, Brasiello M, Annese P, Francione S, Giorgio CM, Moscarella E, et al. Desmoplastic nevus: clinicopathologic keynotes. Am J Dermatopathol. 2009 Oct. 31(7):718-22. [Medline]. Crotty KA, Scolyer RA, Li L, Palmer AA, Wang L, McCarthy SW. Spitz naevus versus Spitzoid melanoma: when and how can they be distinguished?. Pathology. 2002 Feb. 34(1):6-12. [Medline]. Kamino H. Spitzoid melanoma. Clin Dermatol. 2009 Nov-Dec. 27(6):545-55. [Medline]. Hantschke M, Bastian BC, LeBoit PE. 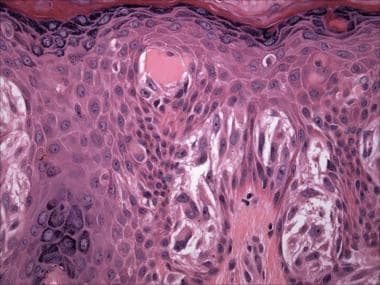 Consumption of the epidermis: a diagnostic criterion for the differential diagnosis of melanoma and Spitz nevus. Am J Surg Pathol. 2004 Dec. 28(12):1621-5. [Medline]. Bergman R, Dromi R, Trau H, Cohen I, Lichtig C. The pattern of HMB-45 antibody staining in compound Spitz nevi. Am J Dermatopathol. 1995 Dec. 17(6):542-6. [Medline]. Ribé A, McNutt NS. S100A6 protein expression is different in Spitz nevi and melanomas. Mod Pathol. 2003 May. 16(5):505-11. [Medline]. Ohsie SJ, Sarantopoulos GP, Cochran AJ, Binder SW. Immunohistochemical characteristics of melanoma. J Cutan Pathol. 2008 May. 35(5):433-44. [Medline]. Shahbain H, Cooper C, Gerami P. Molecular diagnostics for ambiguous melanocytic tumors. Semin Cutan Med Surg. 2012 Dec. 31(4):274-8. [Medline]. Gammon B, Beilfuss B, Guitart J, Gerami P. Enhanced detection of spitzoid melanomas using fluorescence in situ hybridization with 9p21 as an adjunctive probe. Am J Surg Pathol. 2012 Jan. 36(1):81-8. [Medline]. Yazdan P, Cooper C, Sholl LM, Busam K, Rademaker A, Weitner BB, et al. Comparative analysis of atypical spitz tumors with heterozygous versus homozygous 9p21 deletions for clinical outcomes, histomorphology, BRAF mutation, and p16 expression. Am J Surg Pathol. 2014 May. 38 (5):638-45. [Medline]. Kerl K, Palmedo G, Wiesner T, Mentzel T, Rütten A, Schärer L, et al. A proposal for improving multicolor FISH sensitivity in the diagnosis of malignant melanoma using new combined criteria. Am J Dermatopathol. 2012 Aug. 34(6):580-5. [Medline]. Tlougan BE, Orlow SJ, Schaffer JV. Spitz nevi: beliefs, behaviors, and experiences of pediatric dermatologists. JAMA Dermatol. 2013 Mar. 149(3):283-91. [Medline]. Harvell JD, Bastian BC, LeBoit PE. Persistent (recurrent) Spitz nevi: a histopathologic, immunohistochemical, and molecular pathologic study of 22 cases. Am J Surg Pathol. 2002 May. 26(5):654-61. [Medline]. Luo S, Sepehr A, Tsao H. Spitz nevi and other Spitzoid lesions part II. Natural history and management. J Am Acad Dermatol. 2011 Dec. 65(6):1087-92. [Medline]. [Full Text]. Top H, Aygit AC, Bas S, Yalcin O. Spitzoid melanoma in childhood. Eur J Dermatol. 2006 May-Jun. 16(3):276-80. [Medline]. Mones JM, Ackerman AB. "Atypical" Spitz's nevus, "malignant" Spitz's nevus, and "metastasizing" Spitz's nevus: a critique in historical perspective of three concepts flawed fatally. Am J Dermatopathol. 2004 Aug. 26(4):310-33. [Medline]. Barnhill RL, Argenyi ZB, From L, Glass LF, Maize JC, Mihm MC Jr, et al. Atypical Spitz nevi/tumors: lack of consensus for diagnosis, discrimination from melanoma, and prediction of outcome. Hum Pathol. 1999 May. 30(5):513-20. [Medline]. Ludgate MW, Fullen DR, Lee J, Lowe L, Bradford C, Geiger J, et al. The atypical Spitz tumor of uncertain biologic potential: a series of 67 patients from a single institution. Cancer. 2009 Feb 1. 115(3):631-41. [Medline]. Magro CM, Yaniv S, Mihm MC. The superficial atypical Spitz tumor and malignant melanoma of superficial spreading type arising in association with the superficial atypical Spitz tumor: A distinct form of dysplastic Spitzoid nevomelanocytic proliferation. J Am Acad Dermatol. 2009 May. 60(5):814-23. [Medline]. Su LD, Fullen DR, Sondak VK, et al. Sentinel lymph node biopsy for patients with problematic spitzoid melanocytic lesions: a report on 18 patients. Cancer. 2003. 97:499-507. Busam KJ, Wanna M, Wiesner T. Multiple epithelioid Spitz nevi or tumors with loss of BAP1 expression: a clue to a hereditary tumor syndrome. JAMA Dermatol. 2013 Mar. 149(3):335-9. [Medline]. Gerami P, Scolyer RA, Xu X, Elder DE, Abraham RM, Fullen D, et al. Risk assessment for atypical spitzoid melanocytic neoplasms using FISH to identify chromosomal copy number aberrations. Am J Surg Pathol. 2013 May. 37(5):676-84. [Medline]. Hirsch D, Kemmerling R, Davis S, Camps J, Meltzer PS, Ried T, et al. Chromothripsis and focal copy number alterations determine poor outcome in malignant melanoma. Cancer Res. 2013 Mar 1. 73(5):1454-60. [Medline]. Requena C, Rubio L, Traves V, Sanmartín O, Nagore E, Llombart B, et al. Fluorescence in situ hybridization for the differential diagnosis between Spitz naevus and spitzoid melanoma. Histopathology. 2012 Nov. 61(5):899-909. [Medline]. Mason A, Wititsuwannakul J, Klump VR, Lott J, Lazova R. Expression of p16 alone does not differentiate between Spitz nevi and Spitzoid melanoma. J Cutan Pathol. 2012 Dec. 39 (12):1062-74. [Medline].